Aaaahhhh, summer! The most glorious of cycling seasons. Daylight lasts from early in the morning until well after nine o'clock. Race season is well underway, vacations are scheduled, tours criss-cross the countryside, and cyclists are the envy of every hapless car commuter stuck in traffic on a beautiful 85-degree day. Bikes were pretty much made to be ridden during the summer! Of course, summer riding presents its own challenges. The heat can be brutal. Hours of riding in direct sunlight can cause sunburn or even heatstroke. However, the effects of heat can be minimized by careful apparel selection. As temperatures rise, riders tend to naturally move towards a "less is more" approach to dressing for the weather. But when you're only wearing three or four pieces of clothing on a three or four hour ride, those items had better be carefully chosen. Many riders skip the baselayer when preparing for a ride in the summer heat, but these layers actually serve a very important role in regulating body temperature-yes, even in hot weather! Ultimately, they provide insulation-meaning they'll help keep your body's core temperature within a comfortable range whether it's hot or cold outside. In humid weather especially, the wicking power of a good baselayer will help you stay comfortable. That said, summer baselayers tend to be thinner than their winter counterparts, and they often utilize thin vented areas. Sleeveless baselayers are a great lightweight choice in the summer months. The Castelli Men's Core Mesh Sleeveless Baselayer is a perfect option, designed specifically for hot weather riding. In addition to their insulating properties, baselayers also help protect your skin from UV rays. Most cycling jerseys are not sufficient protection from the sun's damaging rays, leading to the curious phenomenon of under-the-shirt sunburn. Two thin layers of protection are usually enough to prevent sunburn. Make sure to wear sunscreen on the rest of you, though! Keep it light. Paired with a baselayer, your summer jersey should be as lightweight as possible. The baselayer is there to regulate your body temperature; the jersey just needs to breathe. Look for full zippers for maximum ventilation. 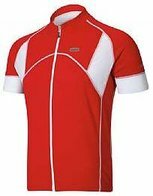 A sleeveless jersey like the popular Pearl Izumi 2015 Men's Quest SL Jersey works great, or choose a short-sleeved jersey like the Louis Garneau Men's Evan's Jersey . Most competitive cyclists choose to wear bib shorts. Over-the-shoulder straps tend to be much more comfortable on long rides than waistbands, which can ride up or down and chafe unpleasantly when wet with sweat. What makes one bib short or pair of shorts different from another? In addition to fabric material, shorts are often described in terms of the number of panels used in their construction-that is, the number of pieces of fabric sewn together to create the garment. Shorts with more panels generally fit the contours of the body better and are more comfortable as a result. However, a large number of panels does not necessarily guarantee the best fit or the most comfort; after all, more panels means more seams. Advanced fabrics with elasticity are sometimes used in place of extra panels. High end shorts usually employ advanced fabrics and careful craftsmanship to create the most comfortable short possible. The 10-panel Castelli Men's Velocissimo Due Bib Short is an excellent option, and the Louis Garneau Men's Neo Power Bib Short is also very popular. Use chamois cream liberally to ensure a comfortable chafe-free ride even on long, hot days in the saddle. PaceLine Chamois ButtR 8oz Tube is a bestseller for us year after year, and we've heard great reports about DZ Nuts Pro Chamois Creme. Pro riders wear hats all year round. 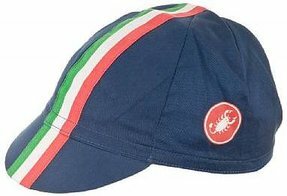 Wearing a wet cotton cycling cap is a great way to stay cool, and the brim also offers a bit of protection from the sun. Try the Giro Classic Cotton Cycling Cap or Castelli Retro 2 Cycling Cap, or if you just want to keep the sweat out of your eyes, a sweatband like the Castelli 2014 Summer Headband. Good road shoes have plenty of ventilation for comfort on hot rides. The aptly-named Sidi 2014 Wire Vent Carbon Road Shoe is a top-of-the-line option designed for the utmost in comfort and performance, but any quality road shoe will do. Remember that black shoes really soak up the heat in the summer-consider a pair that's white, silver, or another light color. Socks should be lightweight and wicking. Avoid cotton, which will just get sweaty and uncomfortable. Enjoy your bright summer rides! Summer is our favorite time to cycle, and we hope that if you have any questions about how to prepare, you'll give us a call at 1-800-682-0570 or contact us by email at [email protected].